Finnair celebrates its 90th birthday on 1-Nov-2013, making it one of the world’s oldest airlines. It also has one of the newest CEOs, Pekka Vauramo, who joined on 1-Jun-2013. Finnair’s strategic niche is based on using its Helsinki hub to connect Europe with Asia. While it saw traffic growth and market share gains in both regions in 3Q2013, the weakness of the yen led to a collapse in Asia revenues. The approval on 16-Oct-2013 of Finnair’s application to join the BA/JAL revenue-sharing joint venture on routes between Europe and Japan could not have come at a more opportune moment. The resulting coordination of pricing and schedules should help to counter revenue weakness. Nevertheless, the fall in Finnair’s 3Q2013 profits and its consequent profit warning for the full year highlight the scale of the challenge facing Mr Vauramo. Although Finnair achieved a further reduction in unit costs, he will need to push through more cost cuts, while simultaneously seeking to shore up unit revenues. Finnair saw a 55% fall in net profit in 3Q2013 to EUR24 million. The same period a year ago benefited from disposal gains of EUR21 million, somewhat distorting the year on year comparison. The operational result, which excludes capital gains and other non-recurring items, fell by 24% to EUR38 million. Revenues fell by 2% to EUR637 million in spite of capacity growth, in part due to the weakness of the Japanese yen. For the first nine months of 2013, Finnair’s operational result fell by 38% to EUR27 million, but its net result grew by 77% to EUR25 million (boosted by a gain on the sale of Finnair’s 4.7% holding in Norwegian Air Shuttle). Finnair now expects FY2013 revenues to be lower than last year, as a result of continued currency-prompted unit revenue weakness and weak cargo and leisure revenues. This has led Finnair to lower its FY2013 guidance from a positive operational result to the possibility that it “will not reach a profitable operational result”. In 3Q2013, Finnair grew ASKs by 6.0%, an acceleration from the 3.1% growth in 1H2013. RPKs grew by 9.9%, faster than the growth in passenger numbers (+8.6%), reflecting increased average sector length. Load factor saw a strong gain of 3.0ppts to 84.4%, but unit revenue (RASK) still fell by 7.1%, with yield (RRPK) down a hefty 10.7%. In the first half, RASK was down by 1.4% and yield by 4.0%. This weak yield was largely a function of the weak yen weighing on euro-denominated revenues. Unit revenue at constant currency was almost level on the prior year period (-0.2%). Yen weakness and the consequent fall in revenues, in spite of strong traffic growth, were the main reason for the decline in the operational result. Finnair is revising its commercial strategy with a view to improving unit revenues. Unit revenue weakness was felt in Asia, Europe and in the leisure traffic segment. In Asia, traffic revenue fell by 7.2% in spite of ASK growth of 4.2% and RPK growth of 9.3%, reflecting the yen weakness already mentioned. With Asia representing 51.5% of Finnair’s ASKs in the quarter, this had a significant impact on the group. 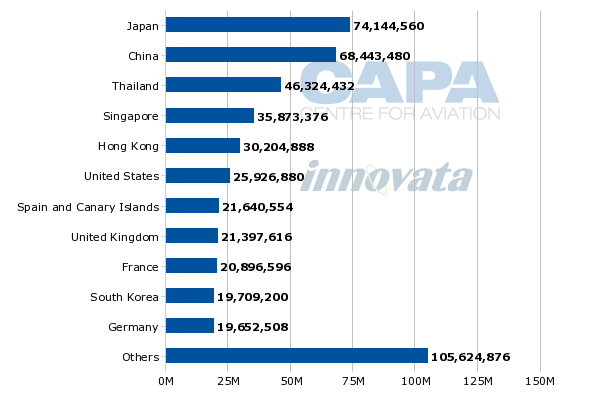 Finnair has 11 Asian destinations, with Japan, China and South Korea its most important Asian destination countries. It aims to increase this to 26 by 2020, adding one or more each year. Finnair’s market share in the route pairs operated by the company in scheduled traffic between Asia and Europe increased to 6.3% in 3Q2013 (from 6.1%). Finnair operated up to 81 weekly flights from Helsinki to Asia in summer 2013. Europe saw strong capacity growth of 13.8% and RPK growth of 17.1%. In scheduled traffic between Finland and Europe, Finnair’s market share increased to 47.9% (46.1%), excluding Flybe operations, but traffic revenues grew by only 6.1% in the region. Finnair’s leisure traffic revenues fell by 11.2%, more than the 2.1% cut in capacity. By contrast, traffic revenue growth in North America and the domestic market outpaced ASK growth (see chart below). Cargo saw revenue growth of 11.9%, but this was much slower that cargo capacity (ATK) growth of almost one third (32.6%). Operating costs were almost flat year on year (+0.3%), much less than the 6.0% increase in ASKs. This control over costs came in spite of a 3.1% increase in fuel costs, which accounted for almost 31% of the total. Unit costs (CASK) fell by 4.6%, less than the 7.1% fall in unit revenues, although ex fuel CASK fell by 6.2%. Finnair continues to expect a fall in CASK ex fuel for FY2013. Staff costs, the second biggest category at 14% of the total, fell by 10% and average headcount fell by 15%. The majority of the staff reductions came in the Aviation Services division following the outsourcing of maintenance and catering activities. Further personnel cost reductions are being targeted. Finnair’s cost reduction programme, commenced in Aug-2011, originally aimed to reach savings of EUR140 million in phase 1 and a further EUR60 million in phase 2. The total target of EUR200 million of annual cost reduction is set relative to its cost level in 2010. Phase 1 and EUR10 million of the phase 2 savings have been achieved. Finnair’s long term aim is to achieve an operating margin of 6% (it was less than 2% in 2012). Labour cost cuts form an important part (EUR35 million) of the remaining target and Finnair has engaged in talks with personnel groups on collective labour agreements and further headcount reduction. According to Finnair: “The objective is to achieve the level of market wages and labour costs in the industry, primarily by implementing changes to wage structures and working hours”. Finnair's Airline Business segment dominates the group’s revenues and operating profit, accounting for 86% of revenues (before group eliminations) and more than 100% of operating profit in 3Q2013. The Aviation Services and Travel Services segments both made an operating loss in the quarter, although the latter made a small profit for the first nine months of 2013. The Airline Business segment, which operates scheduled and charter passenger flights in addition to cargo sales, saw a fall in revenues of 1.6% in 3Q2013. Its operating result fell by almost EUR20 million, or more than one third (-34%), to EUR38 million. For the nine month period, its operating result was up by 27% on last year, reaching EUR39 million, almost all of this achieved in 3Q. This highlights the significance of the seasonally important third quarter to the Airline Business segment and to the group. Last year, the segment only broke even in 4Q and the outlook for further revenue weakness helps to explain why the group is not sure that it can achieve a positive operational result for 2013. The Aviation Services segment recorded an operating loss of EUR2 million in 3Q2013, down from a profit of EUR12 million last year, with revenues falling by 36%. The fall in revenues compared with 3Q2012 reflects the outsourcing of the engine and equipment maintenance activities in Jul-2012 and the transfer of catering activities to LSG in Aug-2012. The segment consists of maintenance, catering and travel retail activities in addition to Finnair’s property and office services. The Travel Services segment recorded an operating result just below breakeven (-EUR0.1 million) in 3Q2013 after a small operating profit (EUR3.8 million) in the same quarter last year. The segment consists of tour operators for leisure travellers, business travel agencies and travel sector software. Revenues fell by 14%, affected by economic uncertainty affecting demand for both leisure and business travel and by travel restrictions to Egypt (the impact of which will also be felt in 4Q2013 and 1Q2014). Finnair is to merge its subsidiaries SMT and Area to create Finland’s largest business travel agency. This should lead to economies of scale and the reduction of overlapping functions and the merger is expected to complete in Dec-2013. The first three of five Airbus A321 sharklet aircraft that are on order to replace ageing 757s was delivered in 3Q2013, taking Finnair’s total operated fleet to 45 aircraft at the end of Sep-2013. It plans to deploy the new aircraft on the Helsinki to London sector. Two more A321s are due to be delivered in 4Q2013 and the remaining two in 1H2014. Finnair owns a further 25 aircraft that were operated by other airlines (mainly Flybe Nordic). The average age of the Finnair-operated aircraft was 10.4 years at the end of Sep-2013. Finnair is due to take delivery of Airbus A350 XWB aircraft from 2015, allowing it to increase seat capacity by up to 18% from around 270 seats on its existing A330/A340 fleet to 310-320 seats and bringing cost per seat reductions estimated at 30% relative to the A340. Japan’s Ministry of Land, Infrastructure, Transport and Tourism (MLITT) granted (16-Oct-2013) anti-trust immunity to a joint business between Japan Airlines, Finnair and British Airways. This paves the way for Finnair to join the existing joint business between JAL and BA, allowing all three to cooperate commercially on services between Europe and Japan. The new JV is expected to be launched in spring 2014. According to the companies: “The revenue-sharing agreement will strengthen the oneworld alliance and enable it to compete more effectively around the world with other global alliances”. This follows Finnair’s entry in Jul-2013 into the oneworld trans-Atlantic joint venture of American Airlines and IAG subsidiaries British Airways and Iberia. Finnair says that the first months of the trans-Atlantic JV have met its expectations. Japan is Finnair’s number one destination country by ASKs, with more than three times the capacity it operates to the USA. Threatened by low-cost competitors on its European network and the emerging Norwegian Air Shuttle long-haul network, Finnair's entry into the BA/JAL JV looks like being its most important strategic step in recent times. Nevertheless, this should not distract it from more mundane, yet equally important, operational priorities such as cost-cutting and product renewal.